Ingenuity’s the key when you’re one of Canada’s smaller university presses. But, as luck would have it, the university did quite the opposite: in 2013, U of R brought in Bruce Walsh, a former director of marketing for literary trade publisher McClelland & Stewart, as director to ramp up the press’s output from 10 titles a year to 20 (they’re working up to 30), and to rebrand the division as University of Regina Press. Clearing the Plains would be the lead title when they relaunched in spring 2013. “Bruce showed up as an outsider with a fresh pair of eyes. He said, ‘This is legible enough to be a trade publication.’ I didn’t really understand the implications of that at the time,” Dr. Daschuk says. His book has gone on to multiple print runs, with more than 18,500 copies in print; it garnered accolades from critics at the Globe and Mail, the Toronto Star, and CBC; it won the Governor General’s History Award for Scholarly Research in 2014; it was the subject of a roundtable discussion at the 2015 Congress of the Humanities and Social Sciences; and when the French translation was published by Les Presses de l’Université Laval in December 2015, it sold 300 copies in the first week. According to John Maxwell, director of the master of publishing program at Simon Fraser University, the tradition Mr. Walsh has been aiming to unsettle traces its roots back to the late-20th century. “The university press is largely an American phenomenon in the post-war period where the U.S. is ascendant in research. There’s money flowing into universities and research centres. Everything is in growth mode,” he says. In Canada, that publishing boom lasted from the late 1950s to the ’70s. No less than eight of the 16 presses currently operating out of Canadian universities were established during that period. By all accounts, the days when the university press could expect to be revenue neutral, never mind revenue generating, are long gone. Tightened purchasing budgets at research libraries, dwindling retail channels, unrealized returns on investments in new technologies, and the reprioritization process that has universities reallocating money to other forms of research dissemination, have left many university presses operating at a loss. What’s more, the costs of producing a scholarly book, which Dr. Maxwell puts at anywhere from “a four-figure sum” to “as high as $50,000 to $70,000,” won’t be much improved by print-on-demand or e-book technologies. “Yet it’s not the kind of thing that anyone can really walk away from because the whole institutional, scholarly and academic apparatus rely on it,” Dr. Maxwell says. While one could argue that all Canadian university presses are fairly small operations compared to their trade and American counterparts, it’s clear that the smallest publishers among the Canadian cohort have been most affected by this dilemma. They’re also fighting tooth-and-nail to overcome it. When Mr. Walsh moved to Regina from Toronto to rebrand CPRC Press as University of Regina Press, he brought a long career of marketing books in both the trade and academic sectors (in addition to McClelland & Stewart, Mr. Walsh had previously worked at Oxford University Press, Routledge, McGill-Queen’s University Press, Literary Press Group, and LongPen, a digital marketing tool conceived by Margaret Atwood). He had been in the driver’s seat on publicity campaigns for more than one bestseller and saw no reason those strategies shouldn’t apply to scholarly texts. The first step was to earmark about one-fifth of the press’s budget for marketing. For Clearing the Plains, for example, Mr. Walsh says they spent about $20,000 promoting the book and made more than 10 times that much in sales. U of R Press’s marketing-focused, trade-friendly approach means Mr. Walsh puts a fair bit of energy into leveraging the relationships he’s developed over the course of his career – connections that helped bring Dr. Daschuk’s book to the shelves of big retailers like Costco and Indigo. But it’s also meant treating academics as he would any other author. For the past decade, WLU Press has been releasing about 35 titles a year in such fields as religious studies, Canadian literature, child and family studies, and film and media studies. The press’s new structure will not only mean tightening the publishing program to about 25 titles a year, but adapting to emerging publishing models, including open access. Athabasca University Press has managed to maintain an open-access publishing program since its launch in 2007. To date, AU Press has published more than 100 titles (12 to 15 titles a year), all of which are open access – readers may freely download the books directly from the press’s website. AU Press publishes under a strict Creative Commons license, which means readers are prohibited from redistributing the work for commercial purposes, using material from the book to create derivative works, or using the material without attribution. Athabasca University is a leader in distance education and e-learning, so it was a given that AU Press would position itself as the country’s top digital-first, open-access university press, says Kathy Killoh, who was the press’s acting director from 2013-2015. “It made sense for the university press to support the [institution’s] mission to increase accessibility and decrease barriers to education and knowledge,” she says. Though researchers in science, technology, engineering and math have generally been more receptive to the open-access model, AU Press is proof scholars in the social sciences and humanities are coming around. In 2015, the press reached the half-million downloads mark for their open-access books – not bad for a publisher specializing in the niche fields of Western Canadian studies and distance education. Besides the fact that it’s one of the oldest scholarly publishers in Canada (dating back to 1936), what sets University of Ottawa Press apart is its bilingual publishing program. UOP is the only university press in Canada that strives to publish as many titles in French as it does in English. The model comes with advantages – it affords UOP unusual access and exposure to the intellectual and artistic communities in both languages – as well as challenges. UOP director Lara Mainville says chief among the difficulties is that they receive more manuscripts in English than in French, which means that most of the 20 to 25 new titles they publish in a year are English. They also deal with two different distribution networks and sales teams to sell into distinct cultural markets. “When I present my titles to Ampersand [an English-language distributor based in Richmond, B.C. ], I present them in a certain way, and then it gets tweaked for the French distributor in Canada, Prologue,” Ms. Mainville says. 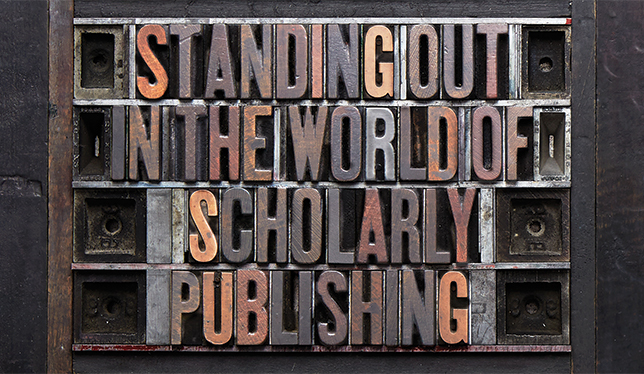 Looking to publish with a university press? Here are the other 12 members that make up the Association of Canadian University Presses. UTP is the largest university press in the country. Its scholarly division specializes in history, political science, sociology, indigenous and cultural studies, Medieval and Renaissance studies. UTP’s higher education division publishes 25 titles a year in history and social science, primarily for class use. UTP also owns a successful distribution service and operates five campus retail stores. UAlberta Press publishes biography, history, language, literature, natural history, regional interest, travel narratives, and reference books. UBC Press publishes predominantly in Aboriginal studies, Asian studies, Canadian history, health and food studies, law, and political science. They recently launched a literary imprint, On Point Press, and offer imprints for open access and class-use texts. The press transitioned into an open access publisher in 2010. They specialize in the Canadian Northwest; the American West; Arctic and Northern studies; energy, ecology and sustainability; and military studies. PUL, a French-language press, produces scholarly, general interest, course, and coffee-table books. They publish across 90 series in fields such as nursing, Quebec studies, North-South studies, and film. UMP is best known for titles covering indigenous and Canadian history, immigration studies, and the Prairies. This joint venture between McGill University and Queen’s University publishes general interest humanities and social sciences titles, in Arctic and Northern studies; history and political science; anthropology and native studies; philosophy and religion; architecture; literature and poetry; sociology; education; and women’s studies, among others. MQUP occasionally publishes in French. The Winnipeg-based press publishes scholarly, reference, and general interest books on Mennonite and Anabaptist studies, as well as occasional church-related biography, fiction, literary criticism, and children’s books. PUQ specializes in French books on business administration, political science, education, social science, psychology, communication, ethics, art, geography and tourism. This French-language publisher covers architecture and urban studies; history and the humanities; literature; health, medicine, nursing and social work; information studies; math; and social sciences. The publishing division of the Institute of Social and Economic Research at Memorial University publishes titles in various fields on the society, economy, and culture of the North Atlantic region. PIMS is the small publishing arm of the Centre for Medieval Studies at the University of Toronto. They publish studies, texts, translations, reference, and collections relating to the history and culture of the Middle Ages.